For the second year in a row, the Canadian men's team won the North American Central American and Caribbean Championships (NACAC) Mountain Running Championships. Led by James Gosselin (3rd), the Canadian men beat the host Mexican squad by a single point. Canadians Kristopher Swanson (4th) and Paul Chafe (6th) finished close behind Gosselin to secure the team victory. Adrian Lambert (11th) and Trevor Caldwell also ran for Canada but did not score points for the team. Joe Gray of the United States won the men's race in a new course record of 1 hour 16 minutes and 44 seconds. Ranulfo Sanchez of Mexico finished in second place. The U.S. Women swept the podium, easily winning the team title over Mexico. 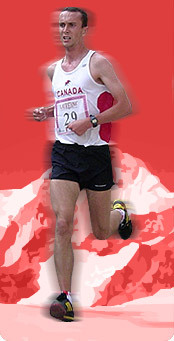 The Canadian team's next competition will be the 27th World Mountain Running Championships in Tirana, Albania on September 11th, 2011. The 8th NACAC Championships were held in Ajijic, Mexico on July 17th, 2011. A special thanks from the Canadian team goes to the great hosts we had in Ajijic, including Ricardo "Chicles" Gonzalez, Iván Romero Garnica, Jorge Alonso Ramos Glez and the whole Gonzalez family.